I am now settling into normal life after my dad’s big funeral / wake. I’ve returned to work and will be really moving into my new apartment, a move that was delayed because of my dad’s illness and death, this weekend. The Chinese funeral rituals are not yet done. Every seven days we have to get together to feed Dad a big dinner. We light candles on a path so that he finds his way back home for dinner while also burning a whole bunch of spirit money for him to use in the afterlife. The burlap cloth outfits reemerged last night, although they were a bit smaller and a lot more wrinkly as my mom stuck them in the washer and dryer. Hubby was happily down in Los Angeles for a work convention. I think he’s gotten his fill of Chinese culture this weekend. 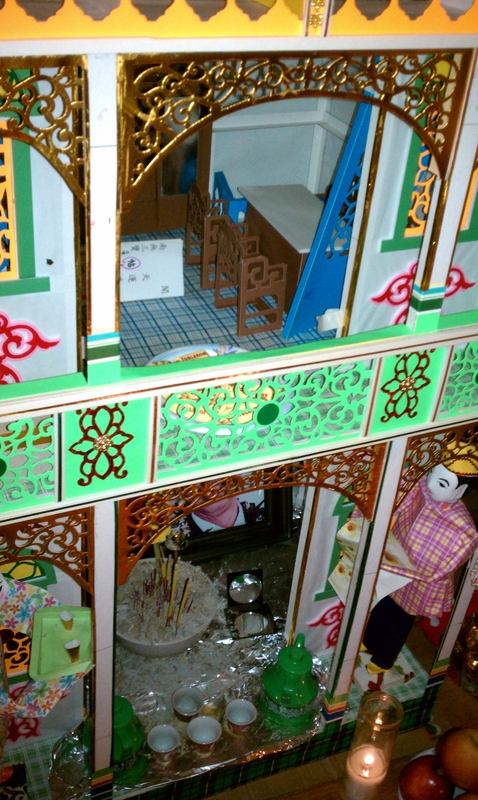 Here are pics of my Dad’s pimpin’ spirit house, complete with servants, a bed, table, chest, etc. He has everything that he needs to live comfortably in the afterlife. Don’t you just love it? Under Taoism, death is not really an end but a continuation of life in a different form. 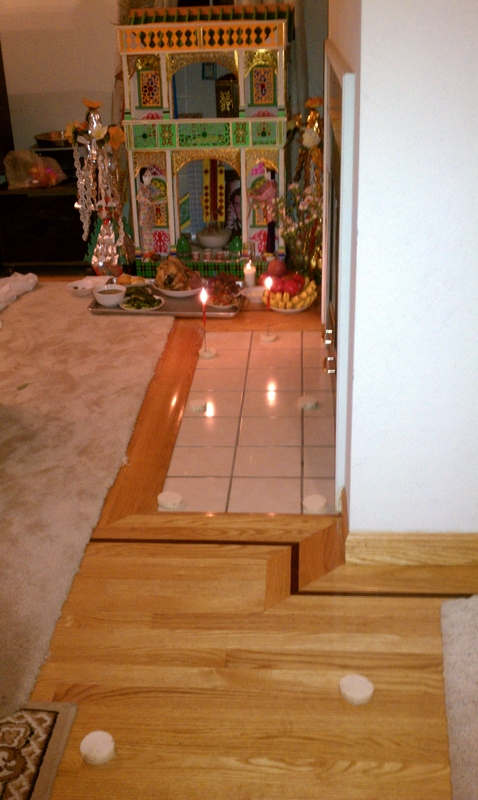 Those white circle things on the floor creating the path are not candles but sliced turnips which we stuck incense into. This whole affair has certainly been a very enlightening cultural experience. I was born in the U.S. and had never been to a funeral before, much less a traditional Chinese Taoist one, so I was almost as lost as Hubby. Weddings and funerals are probably the two biggest events that people experience in life, exposing its participants to feelings of great joy or loss and sometimes both intertwined. Travelers who get the opportunity to witness another culture’s wedding or funeral probably gain more cultural insight in a couple of hours than if they had gone on multiple tours and museum visits. I’ve been to three weddings in Holland and thankfully no funerals. If the need to go to a funeral overseas or even one here in the U.S. which involves different cultural traditions does arise, I’ll be sure to really try to absorb everything. Update: I see that quite a bit of people come to this blog searching for information on Chinese funeral customs. We did the dinner as described above, when my dad’s spirit would return home to eat, once a week for about several weeks (can’t remember exactly if it was six or seven). 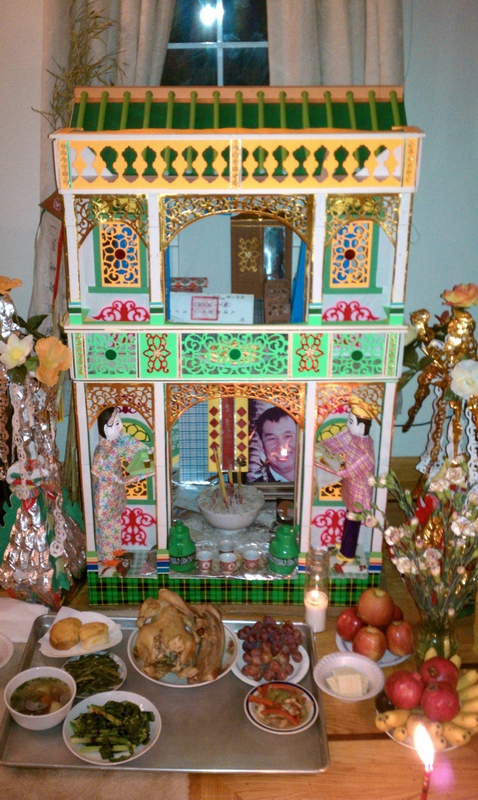 Then about 100 days after he passed away, we had another day when the priests came to do their rituals. We wore the burlap sacks again for these rituals, but then changed into bright new clothes and went to the cemetary with his spirit house. His spirit house as well as our mourning clothes were burned. This is all to symbolize the end of the mourning period and the start of a new beginning. Then we went home and had a big lunch – about 10 courses big!